The adobo salsa is characterized for having a flavor that is strong, a bit spicy, with slightly smoky notes and a soft sweetness. Its thick consistency and dark red color make it very appealing and attractive . – This salsa doesn’t have the same functionality as the other salsas, of being placed on the table center so everybody can serve to taste. This is the salsa that is used to mix with meats while they are being cooked or to marinate them like the dishes of: tacos al pastor , chicken in adobo , pork in adobo , etc. The adobo salsa recipe is often prepared with slight variations depending on the dish and type of meat that will be cooked. 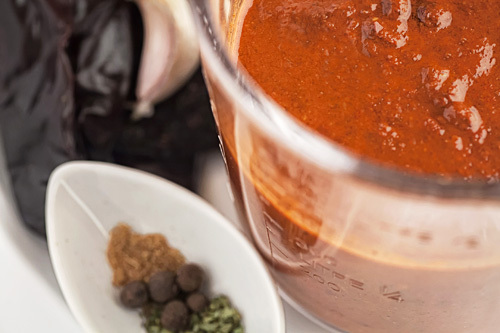 Although it is a salsa that specializes in marinating food you could also use it to sauce some delicious enchiladas. This is a salsa very easy to prepare, you won’t have any problem. In this recipe the chilies’ veins and seeds are not removed however if you want it milder, they can be removed. The adobo salsa is prepared with cumin, just be careful and don’t use too much because its flavor becomes bitter. This recipe will be ready in maximum 10 minutes . Yields approximately 1 cup of salsa. Strain over a bowl the adobo salsa. It is very important to strain the salsa so it has a more homogeneous texture. * This salsa can last a long time in the fridge thanks to the vinegar and the salt that act as preservatives . Variations: Changing slightly the ingredients we get different seasoning and different adobos like the adobo from Queretaro , adobo from Hidalgo and ancho pepper adobo. Did you like the Adobo? These guajillo peppers will give a very good color and flavor to your salsa. Sometimes is difficult to find ancho peppers, however you no longer have to worry about this because you can buy them here. For this recipe you need a good blender and the Ninja is excellent.